New York, New York: Grosset & Dunlap, 1971. Text/BRAND NEW & Bright. Illustrated soft cover/NF showing light surface rubs & faint discoloration. Trim guide alerting mothers and care-givers to hazards within the home itself. Helpful basic first aid information.. First Edition, First Thus. Soft Cover. Near Fine/None As Issued. New York, NY: HarperCollins, 1995. Hardcover. BRAND NEW & Collectible. Stated First Edition, First Printing. 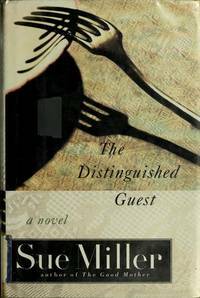 Third novel by Sue Miller, well known for her sensitivity of emotional webs that bind parent and child, husbands and wives, and siblings to siblings. Portrait of an aged mother (the "distinguished guest') visit with her middle-aged son. The mother, Lily Maynard is the central character. A rather self-centered lady of 72, noted writer and advocate of social justice, and now incapacitated by Parkinson's disease, she takes temporary residence with son Alan while awaiting admission to a nursing home. Alan, who thought he had long bedded the emotional baggage of childhood, finds life is not composed of segmented compartments at all. Perhaps temporary American life styles too little time for love.. First Edition, First Printing. Hard Cover. Fine/Fine.